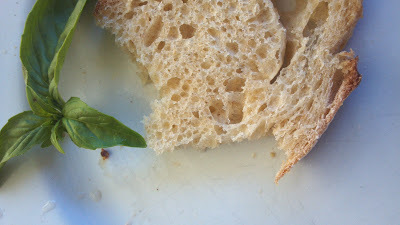 The Food-Minded Mama: Mama's back in the kitchen - and going gray. Ahhh tomatoes. 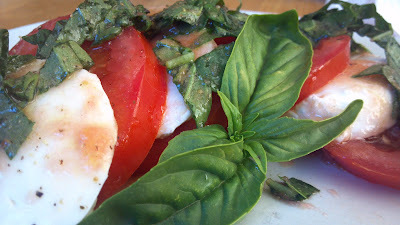 Like every other food blogger ON EARTH, I am posting a picture of a quintessential summer dish: Caprese. 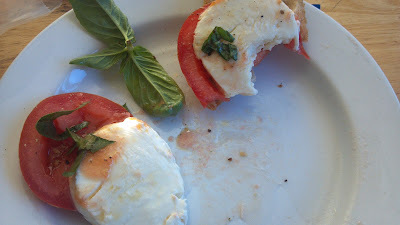 This one is made with fresh Mozz from my local market, vine-ripened tomatoes (no... not the organic heirlooms which were near $6 a pound), fresh basil that's taking over my mom's back yard, salted tomato water, olive oil, and a few turns of cracked pepper. Then, gone. Salted basilic tomato water and all. save one forcibly encouraged bite that the child took. - cereal box + milk carton + bowl + spoon = success. - unopened yogurt container + portion of granola in jar + bowl of berries + spoon = total win and maybe even a thumbs up from the kiddo! - an invitation to help cook eggs + utensil to gather necessary butter for the egg pan + ask for assistance to get a fresh plate from the dishwasher = fascinated and sated child. - place a piece of bread in the toaster over + (watch mom turn on oven... hands off zone) + instruct child to gather jelly and spoon for spreading said condiment on soon-to-be-toasted selection of bready goodness = a mumbling, happy monkey. "Do you want breakfast?" for instance.